Hey everyone! 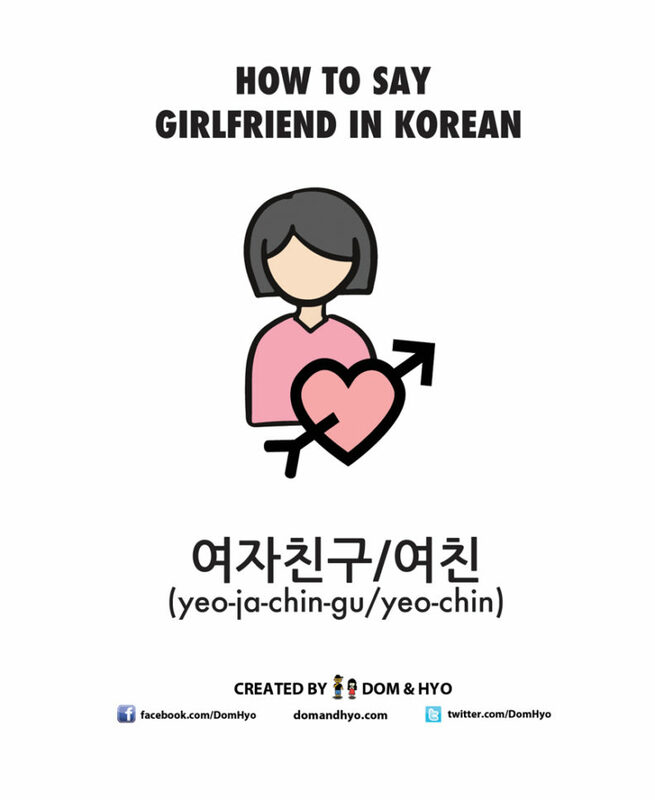 Today, we’re gonna teach you how to say girlfriend in Korean and some related vocabulary. Learning this word is very easy. For example, take 여자친구 which is the standard word for girlfriend. This would be the equivalent of “gf” in English. And that’s pretty much it. However, you wouldn’t use this word for a girl who is simply a friend. You would use 여성 친구 which is basically “female friend”. 여자친구 있어요? (yeo-ja-chin-gu i-sseo-yo) = Do you have a girlfriend? 내 여자친구가 되어줄래? (nae yeo-ja-chin-gu-ga doe-eo-jul-lae) Will you be my girlfriend? 네 여자친구가 되고 싶어. (ne yeo-ja-chin-gu-ga doe-go ship-eo) I want to be your girlfriend. And for more romance related words like pet names/nicknames, check out our other post on this subject! Hey everyone! Hope everyone had an awesome Christmas holiday with your family and friends. We had a pretty good holiday here. Being the introverted couple we are, we decided to chill at home, cook, watch movies, and drink some eggnog (made it myself and turned out great). I’m on vacation for a month, but sadly Hyo still has to work. However, with so much time off, expect more posts from now until late January as I will have more energy to do more work. 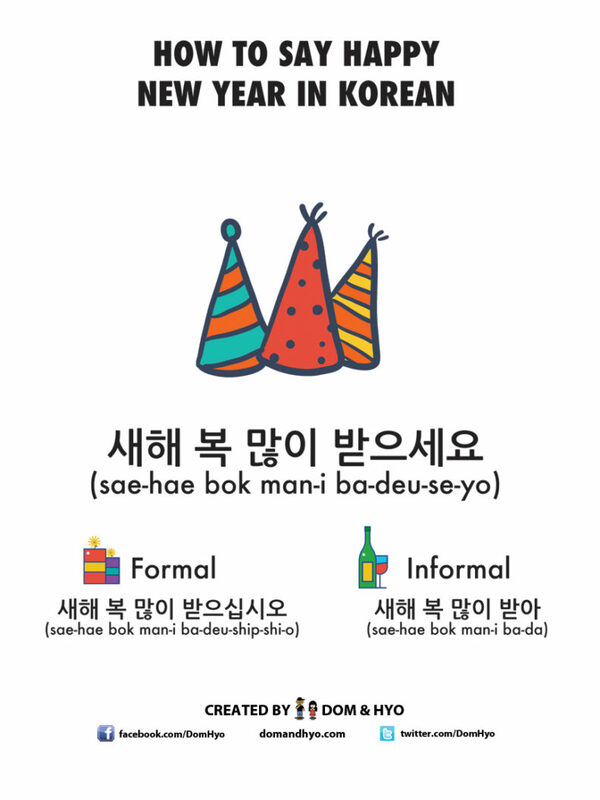 For today, we are getting ready for the new year by teaching you how to say Happy New Year in Korean. You can use this with pretty much anyone you meet. Friends, family, coworkers, etc. Saying this will not come across as rude in most situations. The formal version of happy new year would be used in formal settings and you will find these on formal greeting like cards, emails in the office, or on a billboard on the street. You will probably not use this one, but it’s still good to know and recognize it when you see it. You would use this towards kids or very close friends and family. However, it’s still very rare to use this and the polite version is still the best one to use. Keep in mind that Koreans celebrate two new years. One for the changing of the Gregorian calendar year, and one for the lunar new year. You can use these greetings for both. And that’s it! What are your plans for the new year? Singing and dancing? Staying at home? Regardless of what you plan, we hope you have a happy one and enjoy it! Hey everyone. 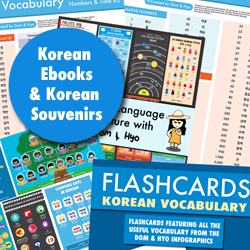 Dom here again ready to bring you another “How to Say in Korean” post. For today’s word, we’re talking about how to say dad/father in Korean. 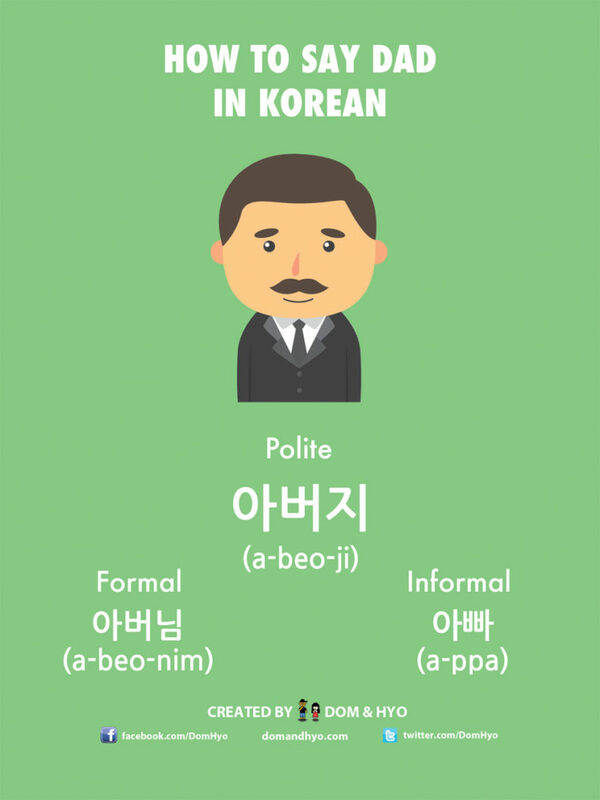 There are three main ways to say dad in the Korean language. This is the most common form you will see and use. You would call your own father by this name. However, you would never use this word for someone else’s father. This is the formal version of the word father. You would address your own father by this terms in formal situations (like a special birthday dinner or wedding). You would also use this to refer to someone else’s father or for your father in law. I call Hyo’s father by this name all the time. This is the informal/casual form of the word father and most children use this for this father in all situations except very formal ones. 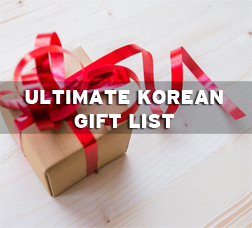 Like the word 아버지, you would only use this for your own father and not someone else’s. Another thing to remember is when you want to say something like “My father.”, you wouldn’t use something like “내 아버지”. 저희 아버지가 선생님입니다 (jeo-hee a-beo-ji-ga seon-saeng-nim-im-ni-da) = My father is a teacher. Hey everyone! November is almost over and Christmas is almost upon us. Hope all my American friends had a great Thanksgiving. 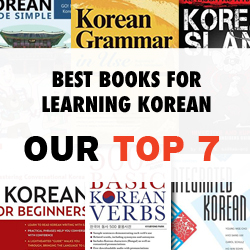 Previously, we did a post on how to say “I love you” in Korean language. Check out that one after you’re done with this one (or now). This post is a little different from that one in that we’re talking about the actual word love and its associations. As you know, love is not only expressed in terms of saying I love you, but in other ways like passions, attachment, etc. This means my love. It’s very romantic and you’ll hear it in poems, romantic movies, dramas, songs, etc. This refers to love in a sense of passion and/or attachment to someone. Think someone who relentlessly pursues someone or treats the person they love as if they are the only person in the world. This is the more technical definition of the word love and was more popular than 사랑 in the past. You can use this to refer to the general feeling of love. This refers to a strong attachment to someone or even an animal. It’s not usually romantic in nature and like an emotional bond. Think of how an infant or baby has a strong attachment to it’s mother. Although it’s technically still fall, we just had our first snow here in the Seoul area a few days ago. The temperature has been bouncing back and forth between below freezing for a few days, and then back up to mildly warm. I have a weird feeling that this will be a warmer winter compared to past winters here as it’s usual still not this warm here. 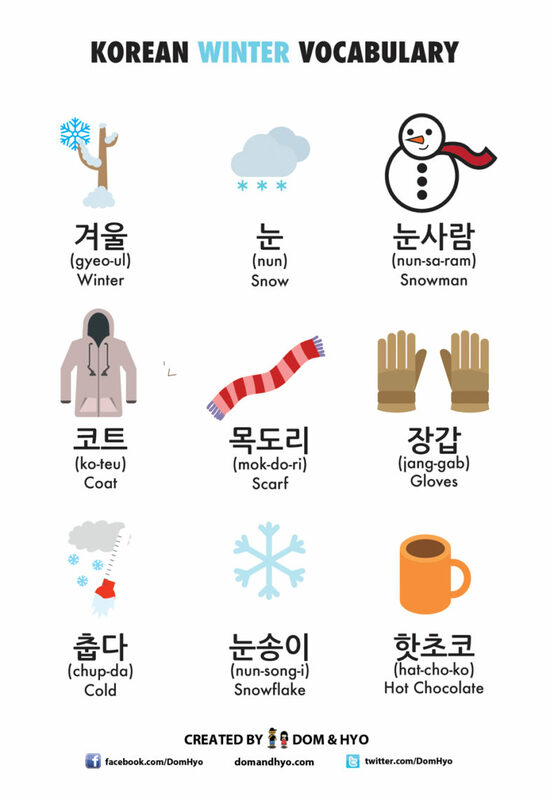 With that said, I thought it would be a perfect time to get some winter vocabulary to you guys. We might make a part 2 for this one around Christmas. These should be helpful for those of you heading into the winter season! Whatsup everyone! Dom here again. 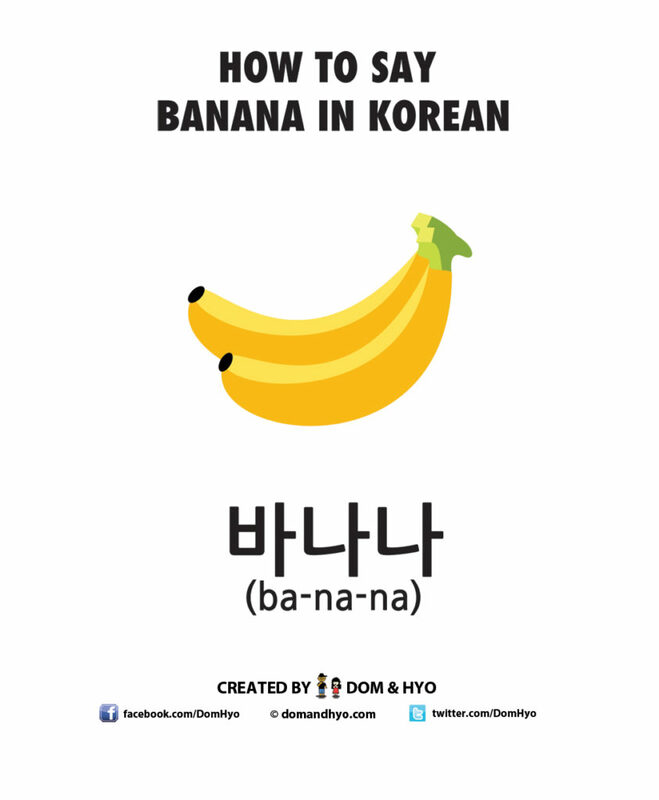 Today, we’re introducing some Konglish to you guys with the word banana in Korean. This is probably the easiest fruit to remember in Korean as it sounds almost exactly like its English counterpart. In Korean, it sounds more like “bah-nah-nah”. 바나나 한 송이 주세요 (ba-na-na han song-i ju-se-yo) = Give me one bunch of bananas please. You can also check out our detailed infographic on fruits here.